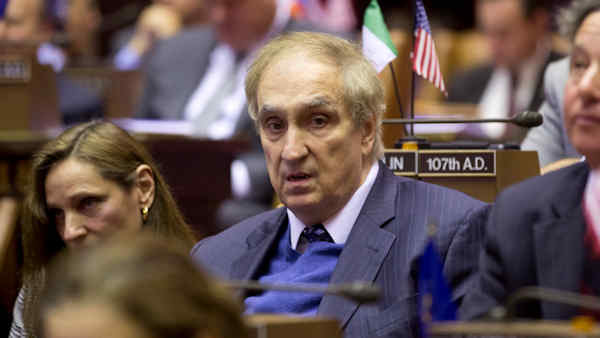 NEW YORK -- Former Assemblyman Vito Lopez, who resigned over sexual harassment allegations after a 30-year career in the state Legislature, has died. He was 74. Lopez died Monday at Memorial Sloan-Kettering Cancer Center in Manhattan, where he had been treated for several years, said his lawyer, Gerald Lefcourt. Lopez, a Brooklyn Democrat, resigned from the Assembly in 2013 over allegations he sexually harassed young women on his staff. The allegations detailed in reports from a special prosecutor and the state Joint Commission on Public Ethics included Lopez forcing his hand up a woman's leg, trying to coerce women to share hotel rooms with him and asking them to touch the tumors on his neck. Lopez denied the accusations but resigned rather than face an expulsion proceeding. Two former aides, Victoria Burhans and Chloe Rivera, settled harassment lawsuits against Lopez this year. The claims were settled for $580,000, most of which was paid by the state. The scandal also engulfed then-Assembly Speaker Sheldon Silver, who authorized secret payments to two other women who claimed that Lopez had harassed them. Silver is on trial in Manhattan federal court on unrelated corruption charges. He resigned as speaker but still represents a Manhattan Assembly district. Lopez also wielded political power as the longtime chairman of the Brooklyn Democratic Party organization. The current chairman, Frank Seddio, said Lopez should be remembered as a fighter for his constituents and not for the scandal. "His legacy is the work he did for the poorest residents of Bushwick and Ridgewood, where thousands of people live in affordable housing on lots that were once burned out and garbage-filled," Seddio said in a statement Tuesday. "As he faces the judgment on the value of his life, my hope is that all the good work that he did will outweigh the unfortunate way in which his career ended," he added.